I hope you all had a wonderful Easter weekend!! Today I am sharing with you Lush's Easter Collection for 2017 and my thoughts on each piece. I got some of these items for Easter on Sunday as well as picked up a few before Easter so all in all I think I have the entire collection to show you! I think it all looks so pretty photographed together. I think most of these pieces are still available in stores whilst stocks last and a few are still online so there is time to pick up your favourites! Either way I really wanted to share my review. 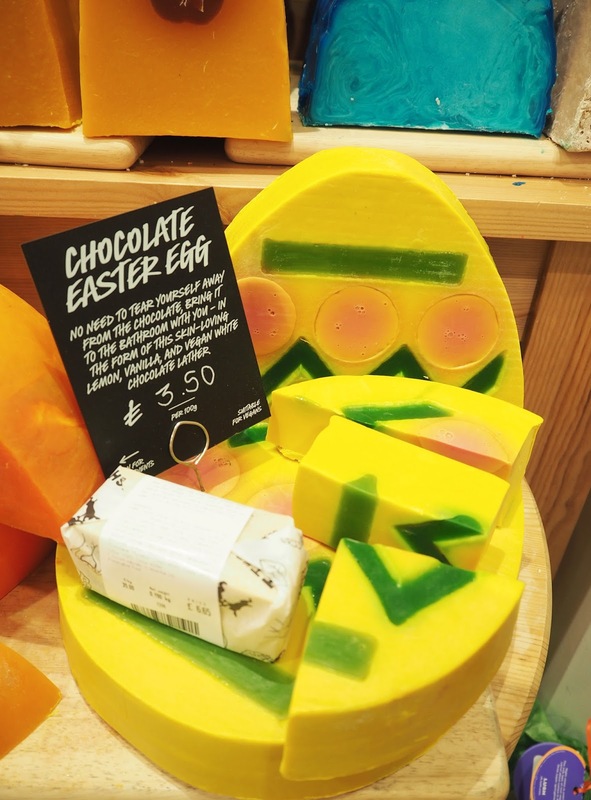 Looking back at my post from last year (Lush Easter Collection 2016) it's interesting to see what they chose to bring back this year and the new additions to their range just like they did with this years Spring Collection & Valentine's Collection. 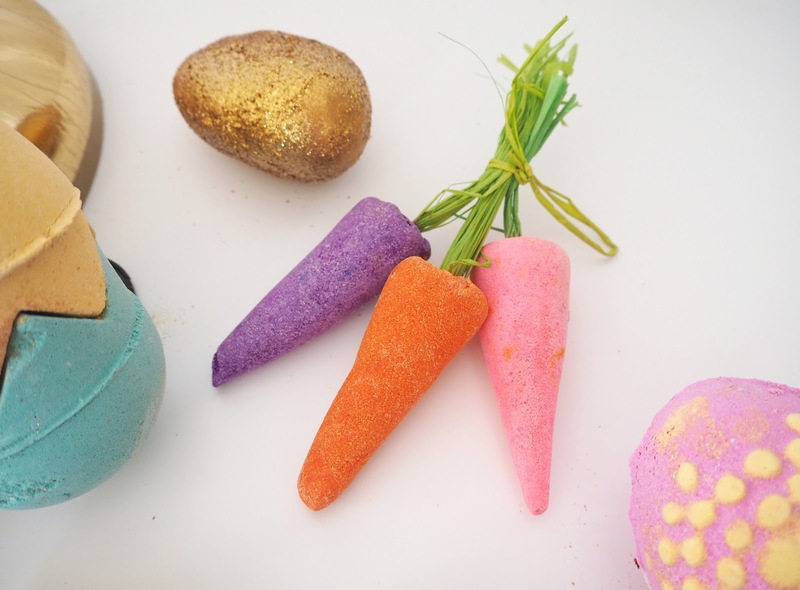 Overall I think it's a really exciting mixture of different products for Easter featuring lots of sweet chocolatey scents, carrots & decorative eggs plus some fab gifts sets, so if you want to try some of the newbies for yourself here is my guide to the entire range! 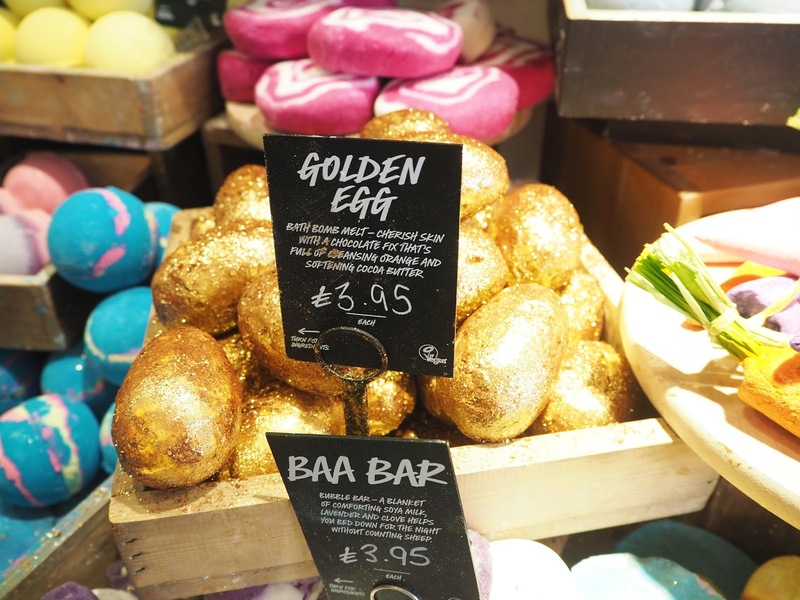 Golden Egg Bath Bomb | This Golden Egg bath bomb will make sparkly like a goddess! I love glitter but if it's not for you then it's perhaps one to steer clear of. It's sweetly toffee/chocolate scented, with bergamot and sweet wild orange oils. 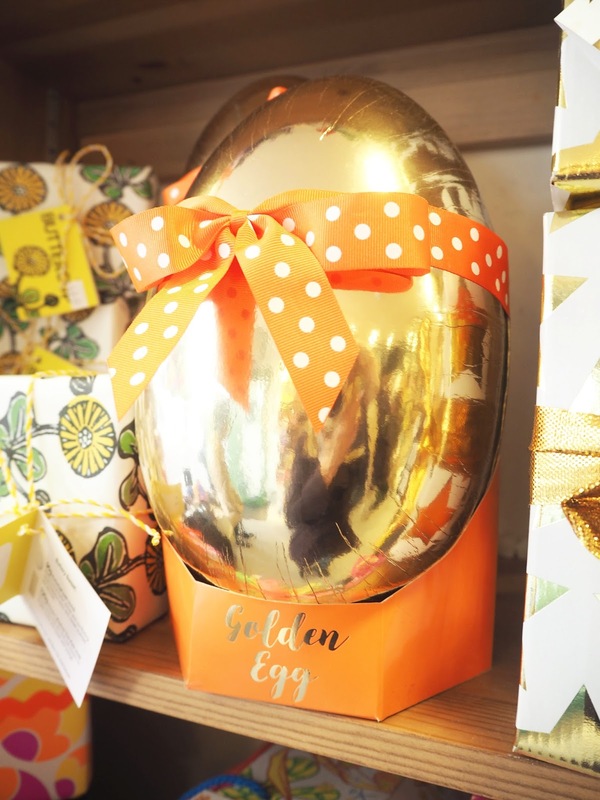 "Every good egg deserves, well, a golden egg of course. Shimmeringly sensual, this sweet wild orange and cocoa butter jewel is the only chocolate fix you should set your heart on. Indulge your skin in a super-softening, skin-loving soak that’s rich with luxurious butters, oils and lustre." 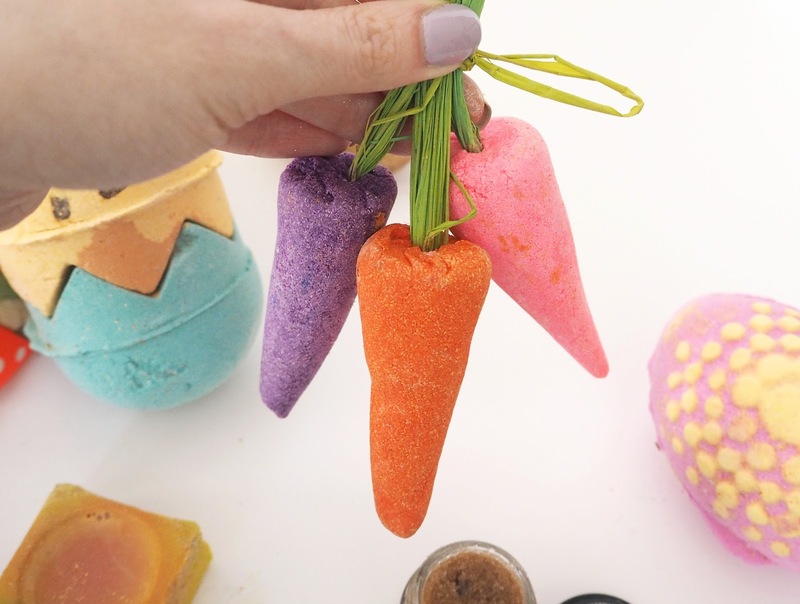 Bunch of Carrots Bubble Bar | How adorable are these carrots?! They were out last year and I was excited see them again so they instantly 'fell' into my basket. These are reusable bubble bars that you hold under the tap to create as many bubbles as you desire, I like mountains! Fragranced with buchu, lemon and grapefruit oils they smell beautiful. "Whatever the root cause of your worries, wash them away with oodles of citrusy suds. Swish and swash this heritage bunch of bubble-makers for a mood-brightening soak full of Sicilian lemon, bergamot and buchu oils, and when you’re done pop it somewhere dry and safe ready to use again and again. Now, that’s the kind of veg you can really carrot about!" 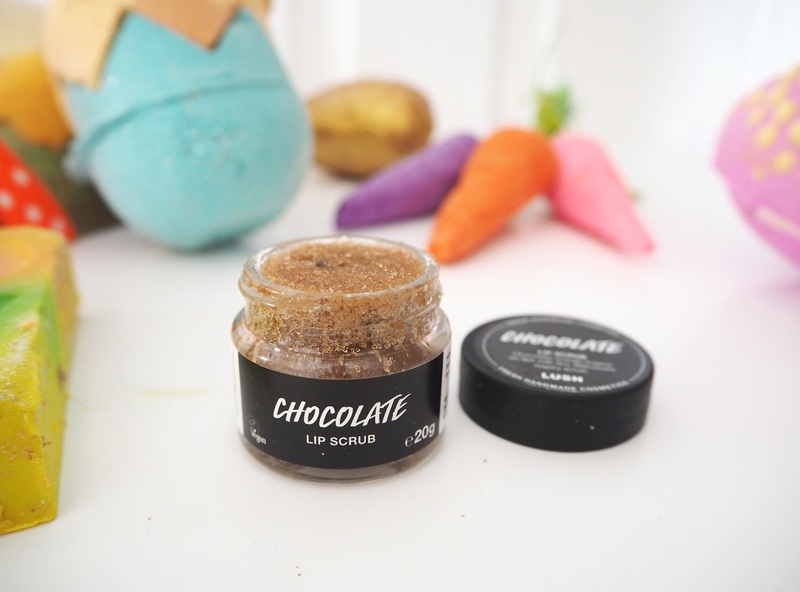 Chocolate Lip Scrub | As you may know I have a bit of a real love for Lush's lip scrubs! I think I've tried almost every single one so far, I have a draw full and use one every other day to keep my lips soft & smooth. 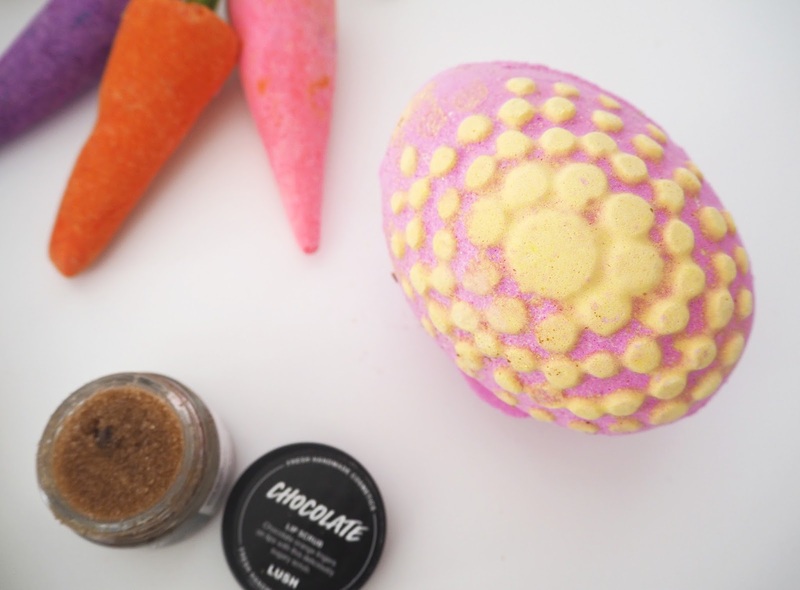 Lush released this divine Chocolate Lip Scrub for Easter which let's face it is just perfect! I actually got a hold of this in the Lush Kitchen last September so already new I loved it and was keen to buy another. Obviously it smells like heavenly chocolate but also has a hint of zesty orange oil through it, literally amazing and I highly recommend you pick it up! "Chocolate orange lingers on lips with this deliciously sugary scrub. Satisfy chocoholic cravings with dark chocolate, cocoa absolute and cocoa powder, just don't feel obliged to share. Tangerine and sweet orange oils mingle to give a juicy kick and leave your lips refreshed. Send a sugar rush to your smackers and scrub all over for a perfectly polished pout. It's not Lush's, it's mine!" 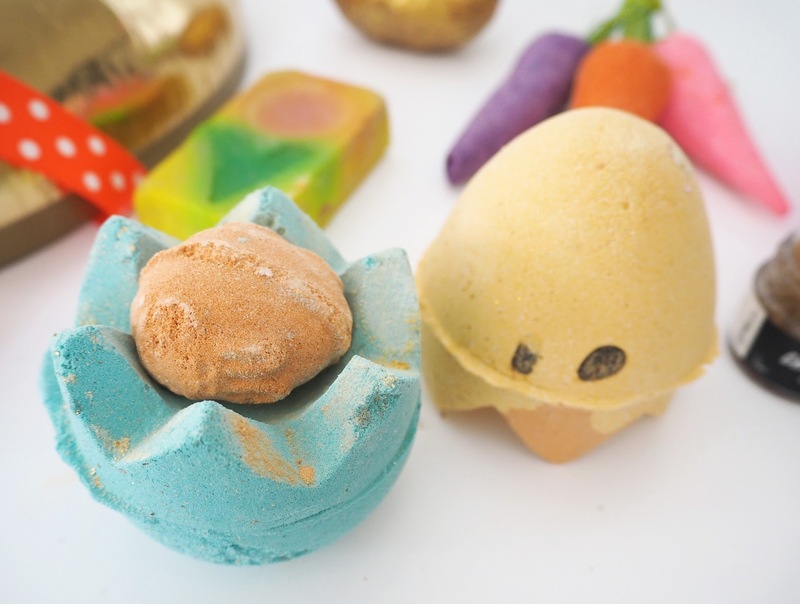 Chick 'N' Mix | I think this Bath Bomb replaces the slightly creepy looking Humpty Dumpty of last year! It's massive and can be used for three separate baths as you have the top and bottom of the egg as well as the little baby chick inside. It comes apart easily which is an improvement on last years which felt cemented together! I love the Tonka and Bergamot mixture too, I can't wait to use it. "A little bit of what you fancy does you good, and a lotta what you fancy, well, it does you even better. This sweet and zingy bomb is full of surprises, as well as comforting tonka absolute and refreshing bergamot oil to add a little spring to your hop, skip or jump." 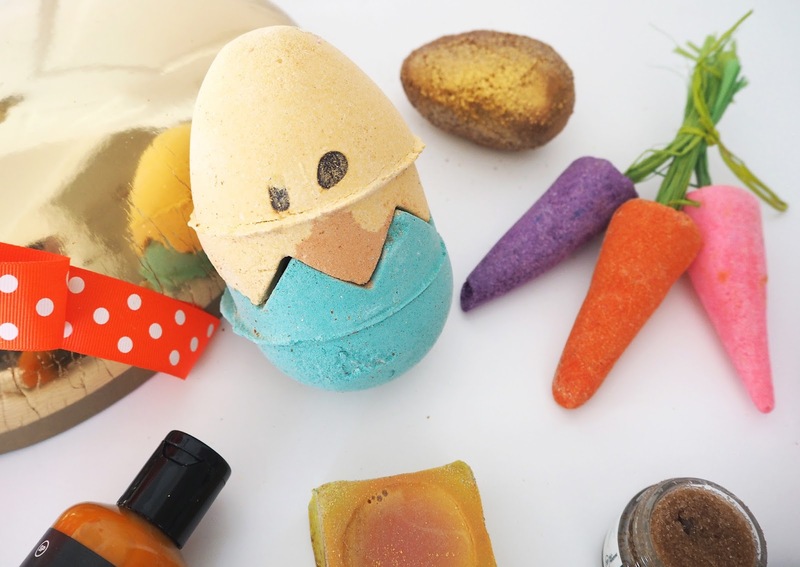 Chocolate Easter Egg Soap | Seriously don't lush make the prettiest soaps?! I love the colours in this one, it's got quite glittery as this one came in my Golden Egg Gift Set and so came into contact with the other products! It smells delicious, like zesty white chocolate. "No need to tear yourself away from the sweet stuff, bring it to the bathroom with you - in the form of this skin-loving lemon oil and vegan white chocolate lather. Rich, creamy chocolate entwines with comforting, sweet vanilla and zesty citrus oils to create a feast of cleansing, conditioning suds." Which Came First? Bath Bomb | Another returning favourite from last year is this large bath bomb! It is strongly scented with citrus like grapefruit and lemon oil which is totally one of my favourites when it comes to bath bombs. "Well, if this barmy bomb is anything to go by, the age-old question is answered. The egg came first, then came the splendid citrusy soaks. Or did it? Who knows? Why not take a dip in cleansing Sicilian lemon and grapefruit oil waters and see if any new information comes to light? 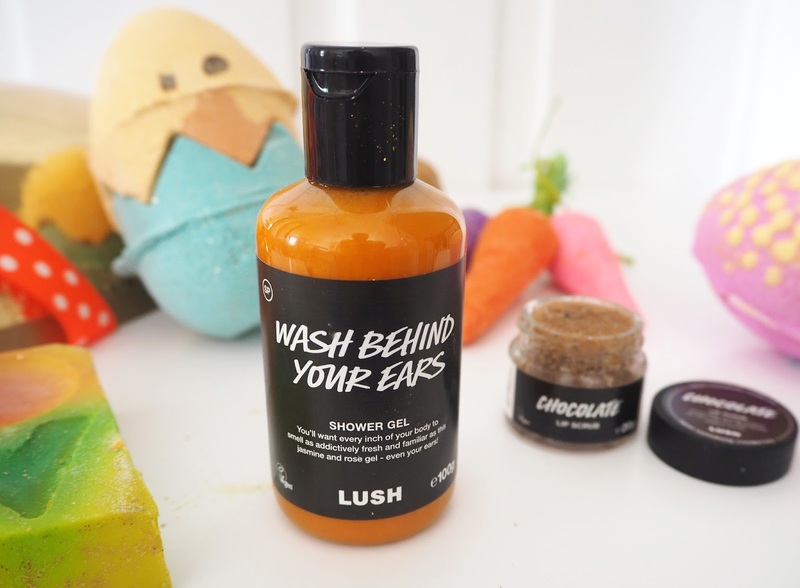 Make sure to chick everywhere..."
Wash Behind Your Ears Shower Gel | I thought the name of this shower gel was particularly cute! As you can see it's a really vibrant orange colour and smells like a real mix of floral, herbal and a little citrusy. At first it reminded me a little of Prince charming shower gel but it's definitely not as sweet. Golden Egg Gift Set | I loved this gift set! 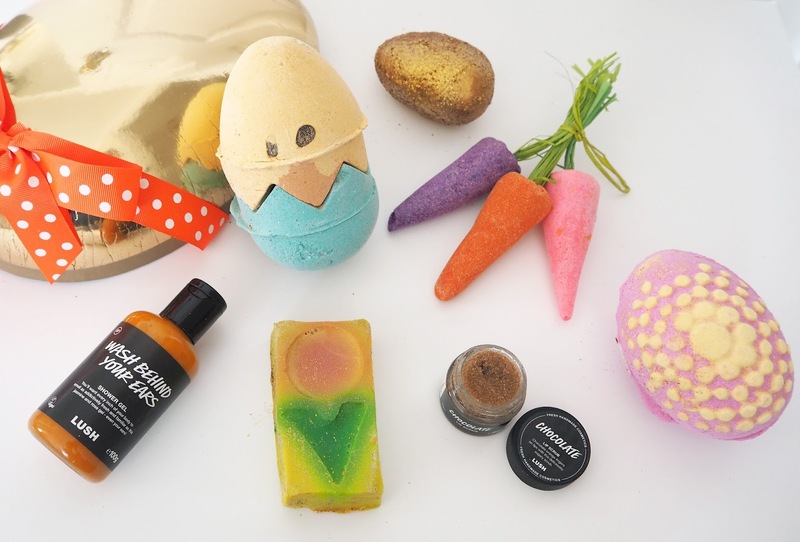 It contained four products: Chick 'N' Mix Bath Bomb, Which Came First Bath Bomb, Golden Egg Bath Bomb & The Chocolate Easter Egg Soap. You can shop the collection online here as well as in stores. Be sure to stock up whilst you can as these beauties will start to dwindle from the shops. The one product I didn't get was the Flopsy Bunny Face Wash Jelly but it sounds like it's been well rated online. I'm really hoping there might be a Summer Collection released this year as (with the exception of the small Father's Day Collection) otherwise we have to wait until Halloween & Christmas for newbies!! What are your favourites from the Easter range this year? Oh my gosh, I'm so jealous, I didn't pick up anything from the Easter collection this year. My bad! 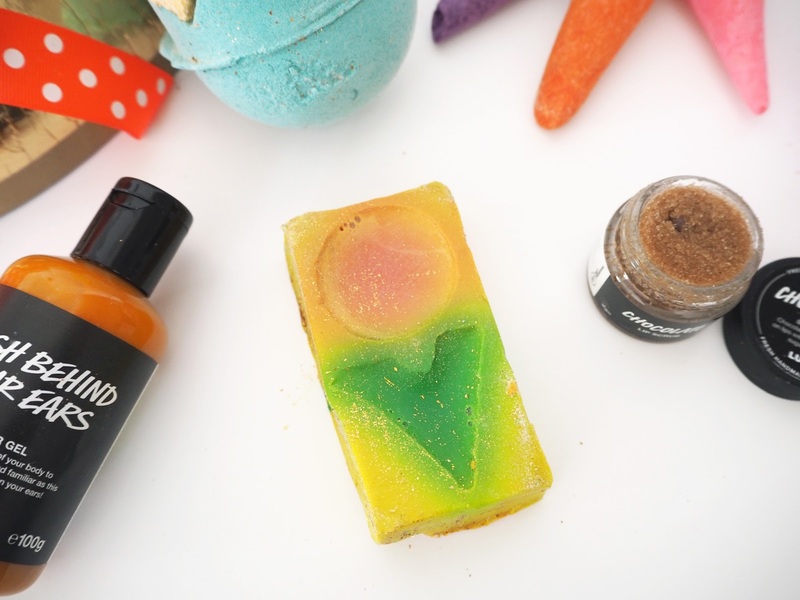 It all looks so nice, especially the carrot bubble bars!